Signed on June 28, 1919 between Germany and the principal Allied powers, the Treaty of Versailles formally ended World War I.
Problematic from the very beginning, even its contemporaries saw the treaty as a mediocre compromise, creating a precarious order in Europe and abroad and destined to fall short of ensuring lasting peace. At the time, observers read the treaty through competing lenses: a desire for peace after five years of disastrous war, demands forvengeance against Germany, the uncertain future of colonialism, and, most alarmingly, the emerging threat of Bolshevism. A century after its signing, we can look back at how those developments evolved through the twentieth century, evaluating the treaty and its consequences with unprecedented depth ofperspective. 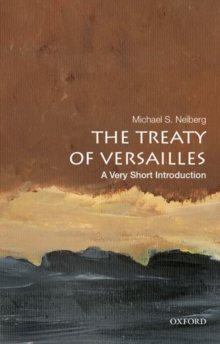 The author of several award-winning books, Michael S.
Neiberg provides a lucid and authoritative account of the Treaty of Versailles, explaining the enormous challenges facing those who tried to put the world back together after the global destruction of the World War I. Rather than assessing winners and losers, this compelling book analyzes the many subtle factors that influenced the treaty and the dominant, at times ambiguous role of the "Big Four" leaders: Woodrow Wilson of the UnitedStates, David Lloyd George of Great Britain, Vittorio Emanuele Orlando of Italy, and Georges Clemenceau of France. The Treaty of Versailles was not solely responsible for the catastrophic war that crippled Europe and the world just two decades later, but it played a critical role. As Neiberg reminds us, to understand decolonization, World War II, the Cold War, and even the complex world we inhabit today, there is no better place to begin than with World War I and the treaty that tried, and perhaps failed, to end it.